Most knitting patterns give cable instructions in chart form. These cable charts show the cable stitches, turning rows, and often some background stitches. Depending on how complicated the cable pattern is, the chart may show you one repeat of the cable or an entire piece. Although chart symbols aren’t standardized, every pattern has a key to the symbols used. 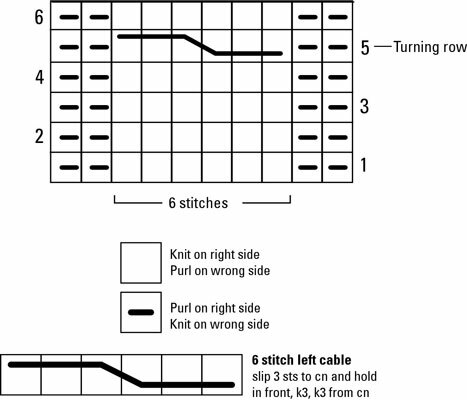 This chart shows a 6-stitch left-twisting cable. A horizontal line in the square: Indicates a stitch that you purl on the right side and knit on the wrong side. An empty square: Represents the cable stitches, which you knit on the right side and purl on the wrong side. The cable symbol in the turning row: Indicates (via the key) whether to hold the stitches in the front or the back. Begins at the bottom of the square and jogs to the top: Hold the yarn in front. Begins at the top of the square and jogs to the bottom: Hold the yarn in back. When you knit cables, you don’t have to cross stitches on every row (thank goodness!). You only cross the stitches on the turning row. After the turning row, you work several plain rows, and then you work another turning row. When following cable charts, you may find it helpful to color in the turning rows. Use a magnetic board and strip to mark your place on the chart to help you stay on track. Sticky notes work well, too. If you’re knitting a pattern that has several panels of different cables, use stitch markers on the needle to help delineate the separate panels. Remember to pay attention to your knitted piece as well as your chart or instructions. Check to see whether you’re cabling in the right direction and have worked the correct number of rows. If you can read what’s happening in your work, you hardly need the chart or the markers after you knit a couple of repeats of the entire pattern.